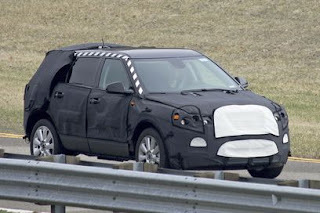 Saab is getting serious about its new SUV, as the latest prototype was spotted going for a test run. Saab’s new SUV, which will be called the 9-4X, will arrive in 2010 to rival the Land Rover Freelander. The new SUV runs off the same platform as the Cadillac BRX. The 9-4X SUV will be available all over the world, unlike the huge Chevrolet based model SUV called the 9-7X which only saw US soil. There will be a vast range of petrol engines, and a new 250bhp diesel engine which will run on Saab’s XWD all-wheel drive system. Prices must still be discussed, but theres a rumour it will be around Â£24,000. Auto insurance isn’t known yet.